Japan Trip like a AHH-SO! by Andrea Petzold who joind the tour 2015. Our guest, also our friend Andrea wrote an article about the tour for the ACMG newsletter called The Arête. She would like to share her experience from the tour with everyone. It was her first time to visit Japan. 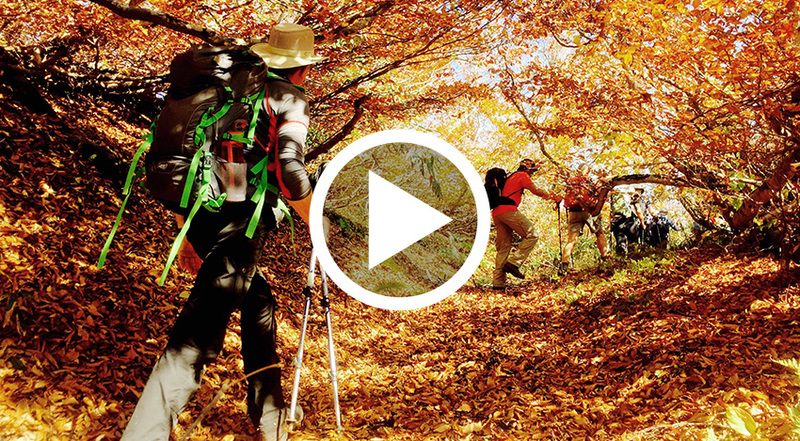 Her unique perspective will help you find what it’s like hiking in Japan with Yamnuska guides. by Hiro Shinozaki who is tour leader for the tour 2015. Please enjoy real action shots and video from the tour in 2015. It clearly shows how much fun it was and what they experienced throughout the tour. Hopefully this slideshow helps you learn more about the tour. In this blog, you can find lots of photos that were taken by our second guide Taichi Ishizuka. During the tour, he captured some amazing images with bright color of Shinetsu Trail. This is a beautiful trail and ridge walk. The Beech tree forests are such a treat to hike through.The fall colours were just spectacular and so very different from what we would traditionally see in a fall hike in the Rockies. The trail length and hiking time each day were perfect. Our guide was fantastic, a true professional. Conscientious, prepared, calm and a lot of fun. He made everyone feel welcome, kept the tone positive and professional. We would highly recommend him as a guide to any of our colleagues or friends. The hotsprings were the best part. 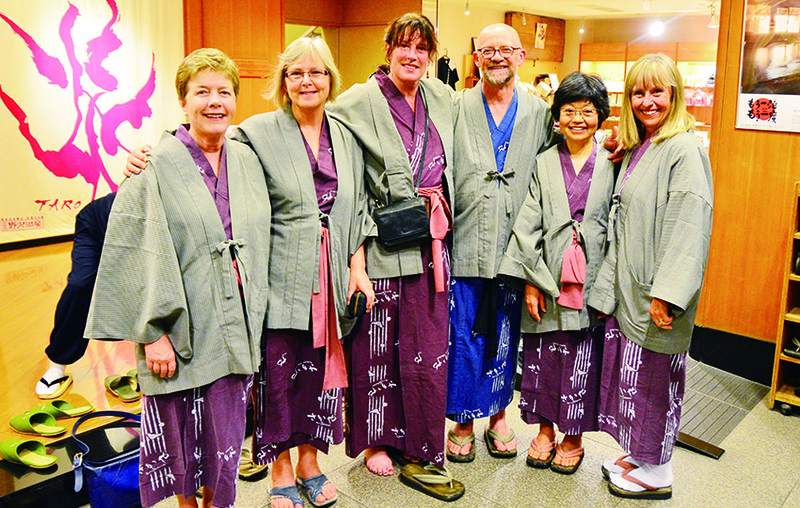 The Onsen experience is a great mixture of the unknown, a cultural exploration and just pure comfortable relaxation. The hot pools are a great treat every night. The bathing system is such a good adventure. Please don't change that ever. Western showers are convenient but nothing compares to a great bath and hotspring. Before going, I definitely thought it was "pricy". Now I feel that I have received more than I gave. Absolute excellent value for $$. I called this tour "Discover Japan" I relearned Japanese culture, history, food, and people who lives satoyama. I was impressed throughout by the professionalism of our guides Hiro and Taichi every step of the way. The quality and variety of the food arranged for the duration of the trip surpassed all expectations. The food was exceptional. More than once, many of us commented that this was as much of a Japanese culinary tour as it was a fantastic hiking experience. What a trip! 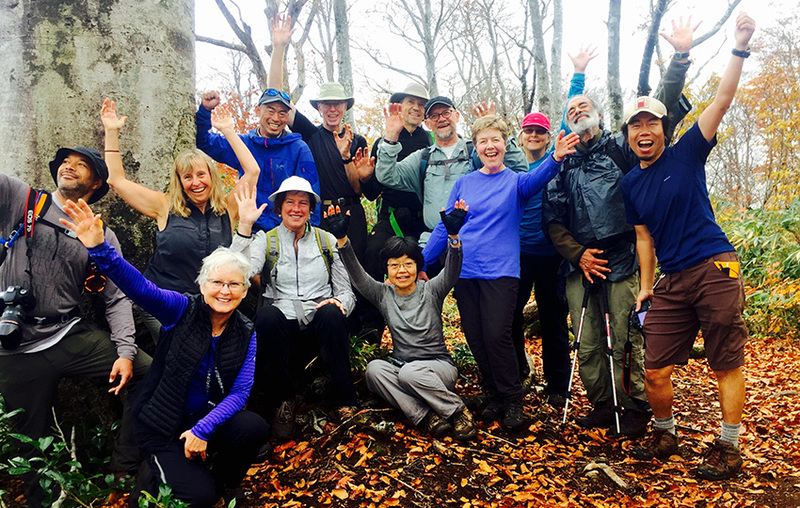 Perfect blend of hiking as well as independent and guided exploration of Japanese culture. This trip exceeded my expectations (which were high anyway). Mostly local Japanese cuisine which is exactly the way I wanted it. Being able to eat such unfamiliar foods when there is someone to explain what it is and how it fits in Japanese culture was one of the best parts of the trip.
. We can't really say anything other than the food was amazing and a huge part of why we enjoyed the trip so much. We didn't expect the food to be that amazing the presentation was out of this world! It was great to have such variety as well. Never been anywhere so clean and tidy! Loved the Washlets! We found the cultural experience amazing. The people, the food, the places we visited were all incredible. We found the hike challenging in part because of the mud which made the steep up and downs more difficult. Having a rest day before the final two difficult days was a must. Overall the pace was great, there was a great educational component, the guides were very helpful on difficult areas of the trail. The organization of the overall tour was second to none. Realizing the high relative costs in Japan, we could not imagine getting a better value for money experience. With all of the food, accommodation and travel involved it was amazing. I recognize that the food we had was of exceptional quality. It was beautifully prepared and the presentation was marvelous. The trip was all that it promised to be and more.I felt that I had a true representation of Japanese cuisine. It was a packed 11 days but I enjoyed every minute of it. Having Hiro and Taichi as guides in Japan was Magical! We really enjoyed such a great & wonderful trip, not only met our expectations but exceeded it exponentially!